April 11 (AZINS) Astronomers on Wednesday unveiled the first photo of a black hole, one of the star-devouring monsters scattered throughout the Universe and obscured by impenetrable shields of gravity. The image of a dark core encircled by a flame-orange halo of white-hot gas and plasma looks like any number of artists' renderings over the last 30 years. But this time, it's the real deal. But there is something more to celebrate. 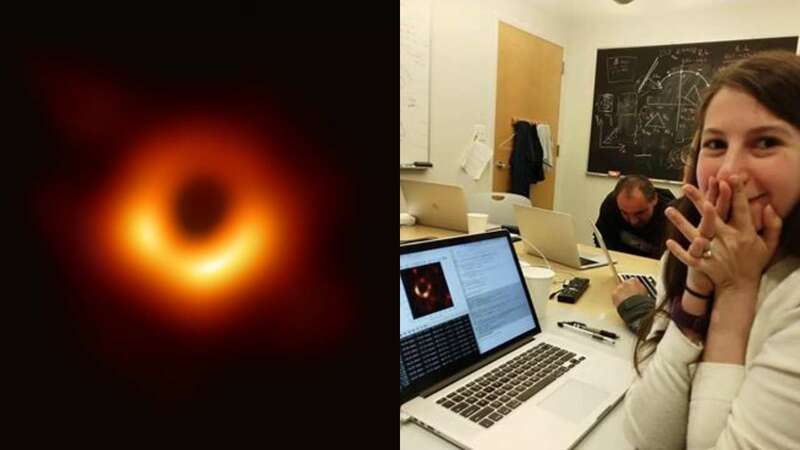 It's a historic day for female scientists across the globe as the first picture of black hole was generated by a young lady named Katie Bouman. According to reports, she helped develop a computer program which helped in creating the image of the black hole. Bouman also headed a testing team that verified the image for the world to see. Bouman started trending after a picture of her standing next to a table stacked with hard drives was posted on Twitter and Facebook. The MIT Grad, Katie, was still in school when she helped develop a computer program that created the image of the black hole. She was also the one who led testing to verify the images, which by itself is a huge task. The data from eight of those telescopes were collected on hundreds of hard drives and flown in to a central processing center. It was apparently set across manually because there was too much of it to send over the internet. It was in June last year, when all the data had arrived at the center.